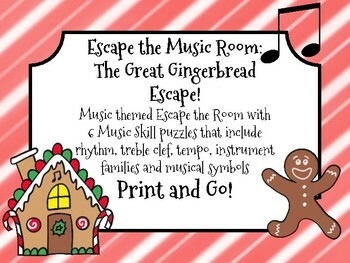 In this Holiday themed "Escape the Room" packet you will find everything you need to set up an escape the music room "Great Gingerbread Escape" experience for your students! 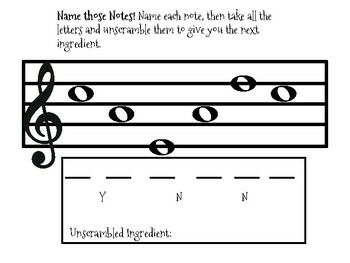 There are 6 music knowledge based puzzles including rhythm, treble clef note names, tempo terms, instrument families and overall musical knowledge. You can easily modify this activity to fit students between 4th and 8th grades. 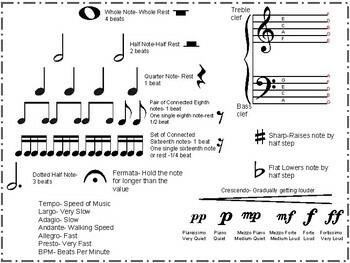 Can be done on a cart or in a music room. I've included a lesson guide to explain how I've used it in my classroom (on a cart) and how you can modify and use it in a classroom. You can also put as much or as little work into it as you'd like to fit your needs. 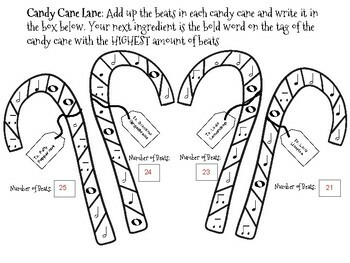 If you want to bring in real gingerbread making ingredients to plant around the room for kids to find the next clue that's great and if you want to use it as a sub plan you can just print the worksheets and have them solve the clues with a sub, that's great too! My students were SO excited when I told them what we were doing, it's a craze that is taking over! If you purchase it and would like template copies of the letters or codes I'd be more than happy to send them in a separate file. Escape the Music Room Jr.